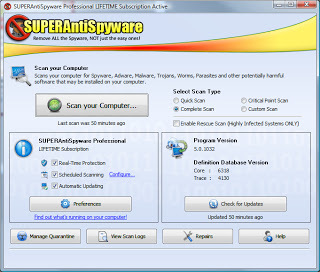 Superantispyware Free, License / Price : Freeware,Size: 20.59 Mb , Author: Superantispyware.com Superantispyware free is Free antivirus which detect over 10.000 of Spyware, Adware and Remove Malware, Trojans, Dialers, Worms, KeyLoggers, HiJackers, Parasites, Rootkits, Rogue Security Products and many other types of threats. Superantispyware has been used by over 30 millions people in the world, so don't doubt his ability. Light on System Resources and designed not to slow down your computer like many other anti-spyware products. Designed not to conflict with your existing anti-spyware or anti-virus solution! Schedule either Quick, Complete or Custom Scans Daily or Weekly to ensure your computer is free from harmful software. Remove spyware automatically. 0 Response to "Download Superantispyware Free 5.6"